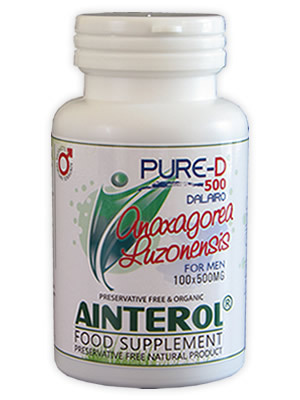 Content: 500mg of 100% Anaxagorea Luzonensis (no starche, fillers or added chemicals any kind). NEW NEW NEW NEW !!!! Anaxagorea luzonensis A.Gray , also known as Dalairo in Philippines, doesn't increase testosterone like Tribulus Terrestris (NAMDIN) or Eurycoma Longifolia (TUNG SAW). along with seven known xanthones and seven known flavonoids were isolated from the bark of Anaxagorea luzonensis A. GRAY and their chemical structures were determined by means of chemical and spectral studies. Almost all flavonoids and one xanthone (13) showed antioxidant activity. Natural compounds of Anaxagorea luzonensis natural componds match well together with all our male herbs. No adverse effects. Anaxagorea luzonensis increased erection length and helped men who had small or medium impotence problems.